(51°17’N, 101°32’W; map sheet 62 N/5). The Assiniboine River has its headwaters just southeast of Greenwater Provincial Park in the Nut Mountain district. It flows in a southeasterly direction through Kamsack and into the Lake of the Prairies across the Manitoba border. Joined by the Qu’Appelle River at St. Lazare, the Assiniboine eventually flows eastward into the Red River in downtown Winnipeg. 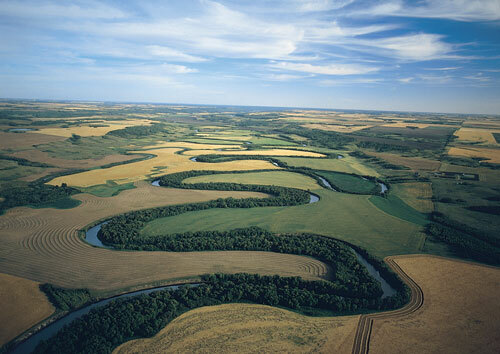 Like many prairie rivers, the Assiniboine occupies a former glacial spillway, flowing through a valley far too large to have been carved by the modern-day river. The Assiniboine was an important link in the Fur Trade, and was probably seen by Henry Kelsey on his journey into the prairies in 1691. In 1774, when Matthew Cocking traveled inland with Samuel Hearne to establish the Hudson’s Bay Company’s first inland post at what became Cumberland House, Cocking’s guides, members of the Sturgeon Cree, wanted the post located in their territory on the upper Assiniboine instead; over the years, a number of trade posts were established along the river, the town of Pelly serving as a reminder of this fur trade connection. Several First Nations reserves located along the Assiniboine, north of Kamsack, also attest to the historic importance of this region to Saskatchewan’s First Nations.